In the past, we’ve discussed the value of a good idea. There are a lot of concepts and notions out there, and the truly solid ones should be celebrated. But, here’s the catch – once one has that idea, they have to come up with other things to fill it out and back it up. This is where the real challenge begins. An idea won’t carry a movie, certainly not a feature-length film, and there needs to be some meat to fill in that bread. Oh, and try to make that meat meaningful. Mortal Engines is a film with a very unique central concept – one that I can truly say that I’ve never seen before. But, once that plot is introduced, the movie must then deliver on the promise that we are in for a unique ride. 1000 years in the future, the “Sixty-Minute War” has not only decimated the population, it has changed the geography of Earth, pushing the continents closer together. (For some reason) major cities and small towns have been collected into a large collection of structures which are on wheels. The “Predator Cities” prowl the landscape, attacking smaller cities for their resources. As the story opens, we see London, rolling across the landscape, running down other cities. Thaddeus Valentine (Hugo Weaving) is the spiritual leader of the city, collecting artifacts from the past, while also working for the city’s future. Tom Natsworthy (Robert Sheehan) works at the city’s museum and is obsessed with finding ancient things, like toasters. When a smaller city is overtaken, Tom goes to the intake point to see if anything interesting has been taken off of the new visitors, where he meets Valentine. Amongst the new arrivals is Hester Shaw (Hera Hilmar), who attempts to kill Valentine. Following a chase, Hester is expunged from London and Tom “accidentally” follows her. Out in the wild for the first time, Tom is confused and scared. Not only does Hester hesitantly help him, she opens his eyes to the true dangers in this world. OK, first things first – the idea of wheeled cities driving around fighting each other is new to me. (Something in the back of my mind tells me that something similar has been done in anime, but I’m not sure.) Based on a novel by Philip Reeve, the notion of a city getting up and moving as the response to a disaster is certainly a unique one. The production design and art concepts here are definitely interesting, as this version of London offers some familiar landmarks such as Big Ben and Parliament packed into a monstrosity which strides atop giant tank treads. The opening at the front of this creation – the one which envelopes smaller cities – is emblazoned with the Union Jack – the finishing touch. Producer/Writer Peter Jackson hands the directing reins to Christian Rivers, who has worked with the Oscar-winning director for years working in visual effects and storyboards, so it’s not surprising that the film has a good look. Despite Rivers experience working in the look of movie and the power of Peter Jackson’s WETA visual effects house behind him, there’s no way for him to get past the cliché-ridden script. Put simply, this movie has never met a cliché that it doesn’t like and it’s actually amazing how unoriginal the movie becomes once we get past the initial concept. If you’ve never seen another movie, read a book, or heard a story, there may be some things here that would come across as surprising, but, otherwise, most viewers will be gobsmacked by how everything here falls into place in a truly predictable way. It would be very easy to say that Mortal Engines steals things from other movies – especially Star Wars…there’s a lot of Star Wars here – but the ideas are so universal and hackneyed they come from time immemorial. I won’t go into specifics, as, for some reason, I don’t want to give anything away, but every relationship, plot twist, and narrative progression is something that you’ve seen many, many times before. I could pause the movie after the first ten minutes, give you a few key moments, and you could fill in all of the blanks. Along with having the distinction of being one of the biggest flops of 2018, Mortal Engines is simply a perplexing movie. I personally don’t think that he’s made a good movie in over two decades, but Peter Jackson is still a powerful figure in the world of movies and, as noted above, his visual effects company is legendary. The effects in this film are certainly impressive and seamless, but they can’t carry the movie. The story is not only overly-familiar, but it’s also too vague – Again, we aren’t given a clear explanation as to how the rolling cities were conceived or built. Another odd thing is that we are presented with this post-fall-of-mankind world, but it’s inhabited by these nice-looking young people. (This piece reminded me of Starship Troopers, but that film did this for a specific reason.) This is a nice-looking, technically proficient film, but it’s so hollow that it barely exists. 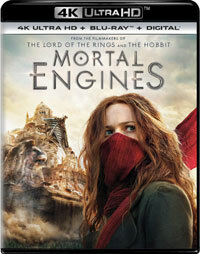 Mortal Engines features yet another movie in which an actress resembles Emily Blunt on 4K UHD courtesy of Universal Studios Home Entertainment. The film has been letterboxed at 2.35:1 and the Disc contains an HEVC 2160p transfer which runs at an average of 70 Mbps. The image is incredibly sharp and clear, showing no notable grain and no defects from the source materials. The picture shows off a great crispness and shows off that clarity which one expects from a 4K. The colors look fantastic and the image is never overly dark or bright. The level of detail is notable, as we can see all of the damage to the cities. The depth works quite well, giving the image a 3D look. The Disc carries a Dolby Atmos audio track which runs at 48 kHz and an average of 5.5 Mbps. The track provides clear dialogue and sound effects. The bass effects, which feed off of the rolling cities, are quite strong, providing a low rumble at times. The surround effects work very well during the action sequences, and some of the sounds are highly detailed. The stereo effects are dynamite, especially when they reflect something passing by the screen. The Mortal Engines 4K UHD contains only two extra features. We begin with an AUDIO COMMENTARY from Director Christian Rivers. “Welcome to London” (26 minutes) is a five-part featurette which explores the design of London, along with the creation of the physical sets and the computer-generated version of the city. Hosted by Robert Sheehan and featuring interviews with many of the key players, including Peter Jackson, this offers a wealth of behind-the-scenes footage and concept art.